People spend way more time consuming media in apps compared to the mobile web. 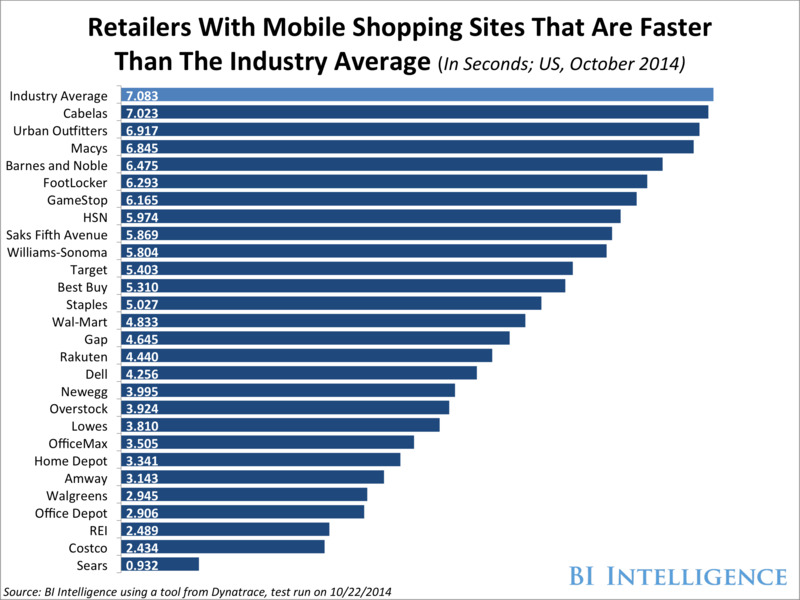 To keep up, retailers have spent lots of money investing in shopping apps to offer customers the best possible mobile shopping experience. So it may come as a surprise that the mobile web is actually a more popular place to shop compared to apps, which means having a high-performing mobile site is just as important as having a great app. In a new BI Intelligence report, we look at how people’s mobile shopping and buying behaviour is shaping up, what consumers expect from a retailer’s site and app, and what causes someone to transition out of an app and onto a site. We also look at how individual retailers’ mobile sites actually perform and at the breakdown of retailer audiences on the browser compared to the app. 58% of mobile retail dollars going to the top 500 mobile retailers will come from the mobile web this year, with in-app purchases accounting for the rest, according to Internet Retailer. The mobile web is also how many consumers prefer to shop on a mobile device. 51% of shoppers were more interested in shopping on the mobile web over apps on their smartphones in 2013, according to Adobe data. 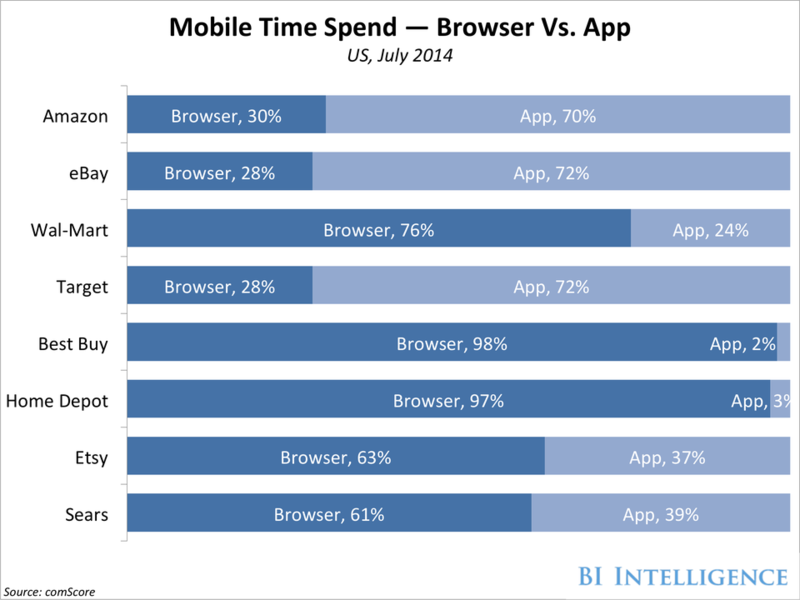 The mobile browser, which is often a gateway to retailer sites, is an important first stop for shoppers using their smartphones in a store. 82% of smartphone shoppers say they use a mobile browser’s search function to research products when they’re in a store, according to a 2013 study conducted by Google. Another 62% say they go directly to a retailer’s mobile website, while only 21% use a retailer’s mobile app in a store. Yet, despite the mobile web’s importance to shoppers, retailers under-utilise their resources for selling through this popular shopping channel. 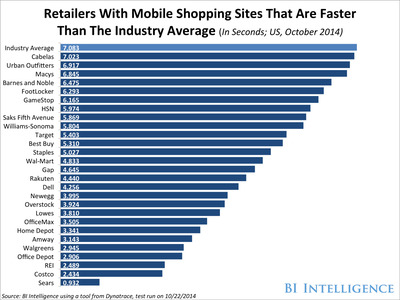 Only 60% of the top 100 global retailers have a dedicated mobile website. In fact, 32% are still showing mobile users a desktop-optimised version of their website on mobile devices. And only nine of the top 100 retailers have a responsively designed site, the format recommended by Google. To access the Mobile Commerce Report and BI Intelligence’s ongoing coverage on the future of retail, mobile, and e-commerce — including charts, data, and analysis — sign up for a risk-free trial.